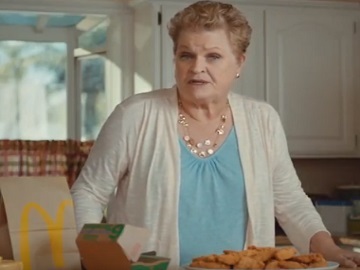 McDonald’s has released a series of new ads aimed at highlighting that its Buttermilk Crispy Tenders are as tasty as Grandma’s so she can pass them off as her own and free up some time which she can use to do many other things, like getting herself back into the dating game. “Finally, I found Chicken Tenders that can pass as mine. Which is nice, because I got better things to do,” Grandma says at the beginning of the 15-second spot, which features her trying online dating. More precisely, she is seen in the company of another lady who’s apparently using Tinder as she keeps swiping when the feedback on the previous profile is “No”. “McDonald’s Buttermilk Crispy Tenders, they’re not Grandma’s, but she’s ok with that,” the voiceover says at the end of the commercial. “Breaded and battered to perfection”, Buttermilk Crispy Tenders are made, according to the fast-food restaurant chain, with “100% white meat chicken and no artificial preservatives, flavors or colors.” They are available for purchase in packs of 4, 6 and 10 pieces, along with a variety of dipping sauces. Among the other things Grandma does are rolling up to the fairway in style in her golf cart and playing poker. This is not the first time Grandma stars in McDonald’s commercials. In 2017, she also appeared in several ads, doing various activities in the time saved by not cooking, such as finishing a 1000-piece puzzle, relaxing on a pool float with a drink in hand, and in a recliner.